The NCAA changed the kickoff return rule so that fair catches inside the 25-yard line, even those in the field of play, put the ball at the 25. It could result in more squib and onside kicks. 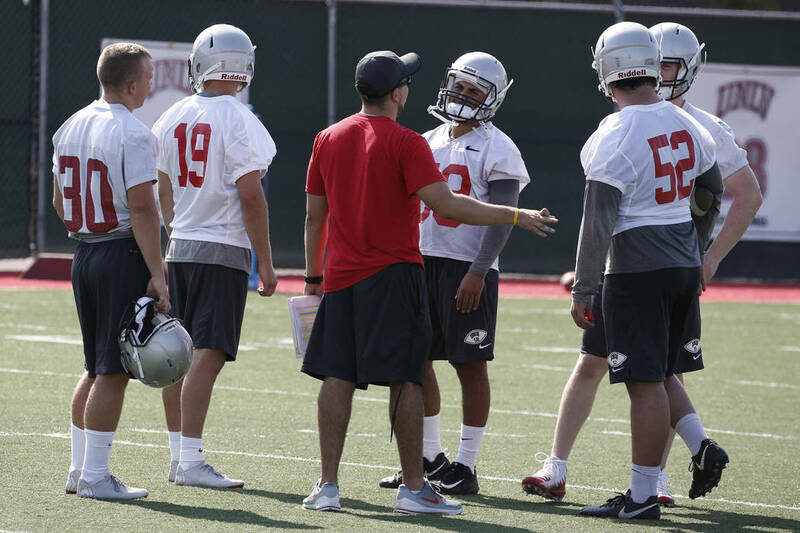 UNLV football coach Tony Sanchez believes the ultimate goal is to eliminate kickoffs entirely, and the NCAA certainly took a step in that direction as a new season nears. The governing body for college sports changed the return rule so that any player who fair catches a kickoff inside the 25-yard line — even in the field of play — gives his team possession at the 25. The NCAA changed the kickoff rule as a way to increase player safety, especially given the added scrutiny in recent years regarding the lingering effects of head injuries. The kickoff return is one of the more exciting plays in football but also one of the more dangerous. With the Rebels in preparations for the season, which begins Sept. 1 at Southern California, they are taking an approach that probably is being duplicated on practice fields throughout the Mountain West and beyond. They are emphasizing sky and squib kicks, which require more finesse than power kicks into the end zone. Pantels, who is competing with junior Hayes Hicken for the kickoff job, is more apt to try to drive the ball through the end zone when facing a return player capable of taking the ball to the other side of the field. Another option is to increase the number of onside kicks. More onside kicks intrigue San Diego State coach Rocky Long. “If you’re really good on defense, you onside kick every time because no matter where they get the ball, tbey’re not going to score much,” said Long, who typically fields one of the Mountain West’s top defenses. Long was asked how much guts it would take for a coach to onside kick every time. The new return rule has created additional special teams meetings in coaches’ offices throughout the country. “You don’t have to have a great kicker anymore,” Long said. “You have to have a skilled kicker. He doesn’t have to kick it in the end zone. He doesn’t have to kick it out of the end zone. He’s got to be able to put it where you want him to put it. San Jose State coach Brent Brennan said he has a good idea how it will play out. Note — UNLV senior Bailey Laolagi is listed as a co-starter with junior Gabe McCoy at weakside linebacker, but Laolagi worked some in the middle during Saturday’s practice at Rebel Park. Junior offensive lineman Sid Acosta has shown similar versatility, playing left guard Friday and center Saturday. More Rebels: Follow online at reviewjournal.com/Rebels and @RJRebels on Twitter.